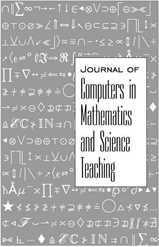 JCMST is a highly respected scholarly journal which offers an in-depth forum for the interchange of information in the fields of science, mathematics, and computer science. JCMST is the only periodical devoted specifically to using information technology in the teaching of mathematics and science. JCMST is the official journal of the the Association for the Advancement of Computing in Education (AACE). Members have free, online access to all back issues via LearnTechLib–The Learning & Technology Library. Indexed in leading indices including: Scopus, Educational Research Abstracts, ERIC, LearnTechLib-The Learning and Technology Library, Index Copernicus, GetCited, Google Scholar, Journal Seek, Microsoft Academic Search, Bacon’s Media Directory, Cabell’s, Ulrich, and several others.